Rocaille can be defined as asymmetrical decoration that imitates the forms of shells. This exuberant, excessive, undulating motif was widely used during the 18th century, giving its name to the Rococo style. 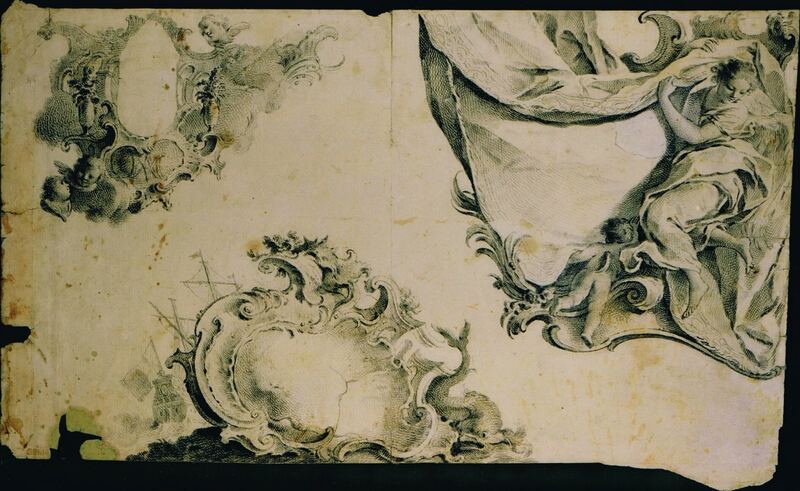 It is used here in the present drawing by José Camarón Bonanat for his depiction of the sea and was applied by him to the borders of decoration in other works. The artist was one of the leading Valencian painters of the second half of the 18th century and a representative of the Spanish Rococo style, together with Antonio Carnicero (1748-1814) and Luis Paret y Alcázar (1746-1799). The present drawing is among the many by the artist intended for prints, in this case depicting decorative cartouches to surround and embellish a map of the Archbishopric of Valencia. Executed in fine lines of black chalk and reed pen with black ink, Camarón precisely defined a series of clearly Rococo elements to be used to frame the texts that would appear on the map. In the 16th and 17th centuries use was generally made in Spain of maps from Venice, Flanders and Paris, translated into Spanish. However, in the second half of the 18th century a local tradition of mapmaking arose, and it is in this context that the Map of the Archbishopric of Valencia can be seen. Produced in 1761, the cartographer was Tomàs Vilanova while the printer was Hipòlit Ricarte. 3 It depicts both the diocese of Valencia and that of Segorbe and includes the area of Vilafermosa that belonged to Valencia until 1960. Also marked out on the map is the projected new bishopric for the city of Xátiva, which aimed to obtain this ecclesiastical status. The reverse of the present sheet has a series of sketches for what appear to be bookplates, in the form of small cartouches with a name inside. Some are allegories of Literature and Painting, thus indicating the profession or interest of the person for whom the bookplate was made. In addition, on one side of the sheet are two small scenes taking place in a sword shop. Both images depict the same subject but with the position of the principal figures changed from the left to the right. Camarón depicts the sword-makers tempering the blades and another figure who has weighed them and is hanging them up for sale in the shop window. Particularly striking is the marked contrast between the crisp, exquisitely detailed style of the drawings for the Map of Valencia and the disordered, synthetic and sketchy nature of these images. For further information on the series for San Francisco el Grande, see: Fecit I (2010), pp. 41-43, cat. no. 10. For further information on the artist’s life, see: Ossorio y Bernard (1868), pp. 119-120 and Rodríguez Culebras (1968). There are numerous copies of this map in libraries and archives, including the BNE (MV/9).